Mer up to 85°+ 2 o,c, P.M. Wednesday October 1 Still unpleasant this morn with slight showers, but cleared up so Lena had most of the clothes out before noon, still warm, Mer up to 80°+ again in P.M. Being washing day I did up chores after breakfast & helped about dinner. This with my usual chores kept me busy most A.M. 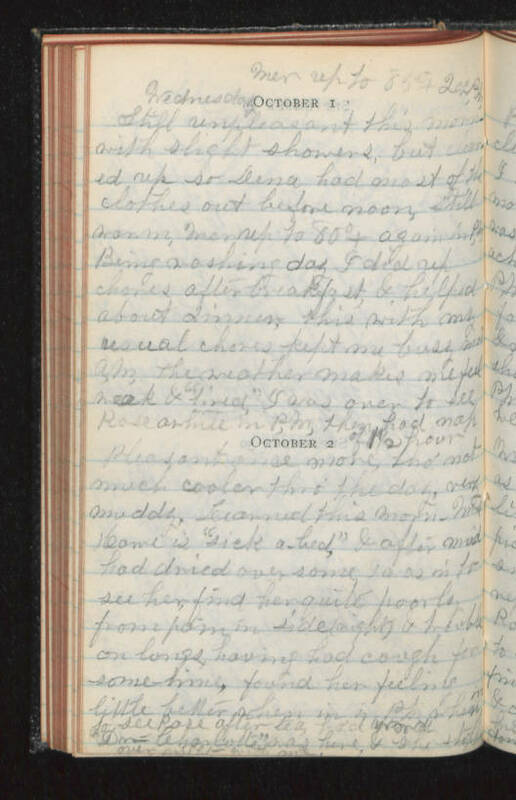 The weather makes me feel weak & "tired" I was over to see Rose awhile in P.M., then had nap of 1 1/2 hour October 2 Pleasant once more, tho' not much cooler thro' the day, very muddy. Learned this morn - Mrs Howe is "sick a-bed" & after mud had dried over some I was in to see her, find her quite poorly from pain in side (right) & trouble on lungs, having had cough for some-time, found her feeling little better when in in P.M. Then in to see Rose after tea, had work done - Charlotte was here & she stayed over night with me.